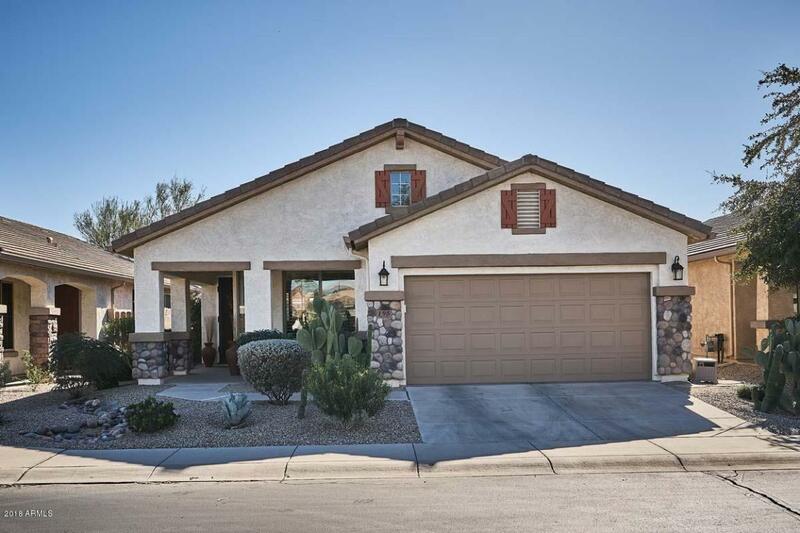 Lightly lived in home that sits on the 8th green of the Johnson Ranch golf course. Home has tile and hardwood floor no carpet. Kitchen has staggered maple cabinets, under cabinet lighting, tiled back splash, pull out shelves and upgraded stainless appliances and corian counter. Mstr bedroom has walk-in closet and newly upgraded shower & bath. Newly upgraded shower in guest bath also. Home also has California shutters through out. Enjoy the beautiful AZ sunsets on your extended paver patio with soothing water feature, built in BBQ, natural gas firepit. Extended length garage with built in cabinets, epoxy flooring and workbench. Solera is a Del Webb community with year round heated pool & spa, community center and many activities.